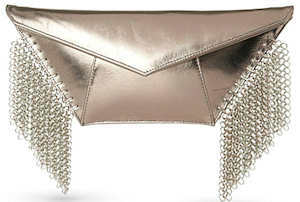 The Kzeniya Wild Chain Clutch is an envelope style clutch bag created by Kzeniya Oudenot, who is a graduate of the famous London St Martin’s College of Art and Design. The clutch has a concealed magnetic fastening and is embellished with chains to the sides, which make a gentle sound as they clink together as you move. Inside, the bag is fully lined in Kzeniya logo fabric and there is a small slip pocket. 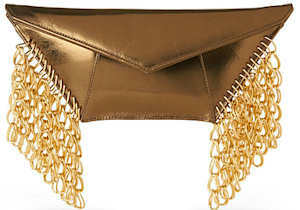 The clutch is delivered with a Kzeniya London drawstring dust bag. 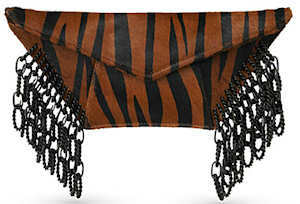 Material: The tiger clutch is made from calfskin leather and metal, the gold and silver clutches are made from leather and metal. I am fortunate enough to own the tiger version of this clutch, and it really is rather special. It is beautifully made, the calfhair leather is sumptuous and the clutch looks completely different to anything else out there thanks to its chain embellishment. This clutch has a uniquely exotic look and feel and would add a great finishing touch to any party frock or Little Black Dress. Kzeniya has won many awards for her designs, and before starting her own label in 2010 she has previously worked for Alexander McQueen and the Royal Opera House, amongst others. Her bags have already been featured in Elle, Grazia and Vogue and have been carried by many celebrities including Jennifer Lopez, Elizabeth Banks, Kate Beckinsale, Shakira and Jessie J. She takes the inspiration for her designs from sculptures and architectural forms. The bags are constructed in small workshops in London and Spain, and the final chain embellishments are hand applied in her own studio. The leather used for the bags comes from Italy.